← Chanel Misia and A Visit To The Harrods Salon de Parfums – Plus A Giveaway! Dip dye silk is a truly special thing. A completed scarf, silk screen-printed as every other, is after completion dyed all over again in a single vat of colour (hand-stirred!) to give the silk not only a new, more uniform hue, but also a uniquely soft texture. Dip-dye scarfs, or carrés surteint in French, boast the softest, most delicate, almost velvety silk imaginable. This tactile sensation along with the delicate shading that abolishes stark contrasts, makes these type of scarf my absolute favorite. Nothing feels, ties or looks quite comparable to a dip dye. Accompany me on a journey of three scarves today. The full scarf comprises of strips of five existing scarf designs, Couvertures et Tenues, Tigre Royal, Brides de Gala, H Cinétique and Pani La Shar Pawnee. It has been released several times in various incarnations, as a 90cm silk carré, a 140cm cashmere shawl, 90 cm dip-dye and as a maxi- twilly. The design acquiesces gracefully to a multitude of metamorphoses. A selection of the house’s most celebrated scarfs are cut into elongated strips, artlessly juxtaposed to create a new motif. Horse blankets and day covers by Jacques Eudel grace the profiles of four horses dressed for relaxation or show. Christiane Vauxelles’s portrait of the Royal Bengal Tiger is every bit as imposing bisected along its central axis as it is whole! Next comes Brides de Gala, essential and unmistakeable at a glance. 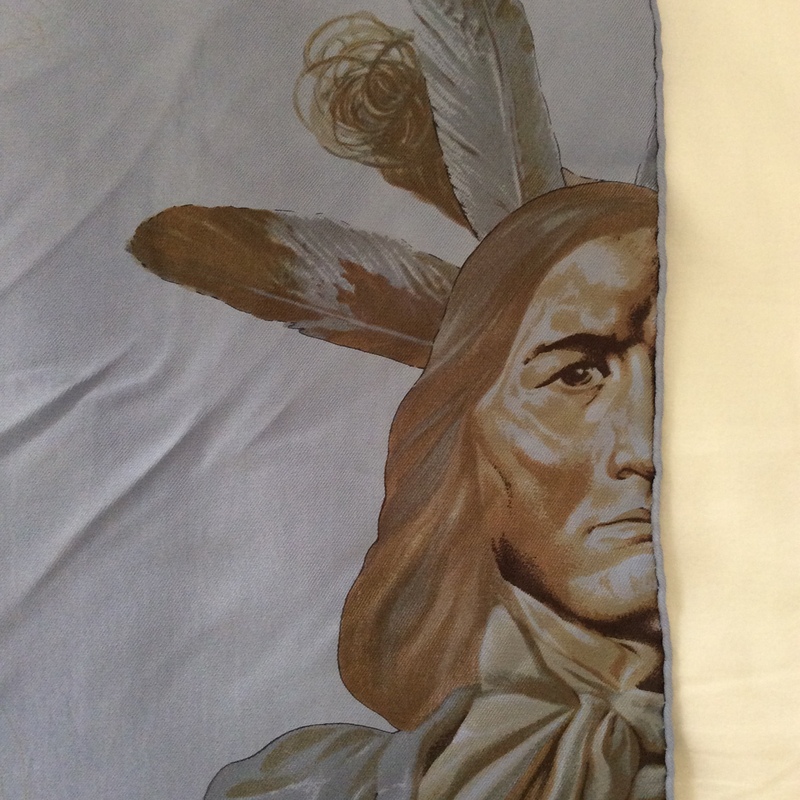 The rippling lines of H Cinétique lead us to Kermit Oliver’s portrait Pani la Shar Pawnee, showing the First Nation chief whose solemn gaze embodies the ancient wisdom of his people. A quintet of classic scarfs, squared. Pani La Shar Pawnee looks concerned and sad but regal. 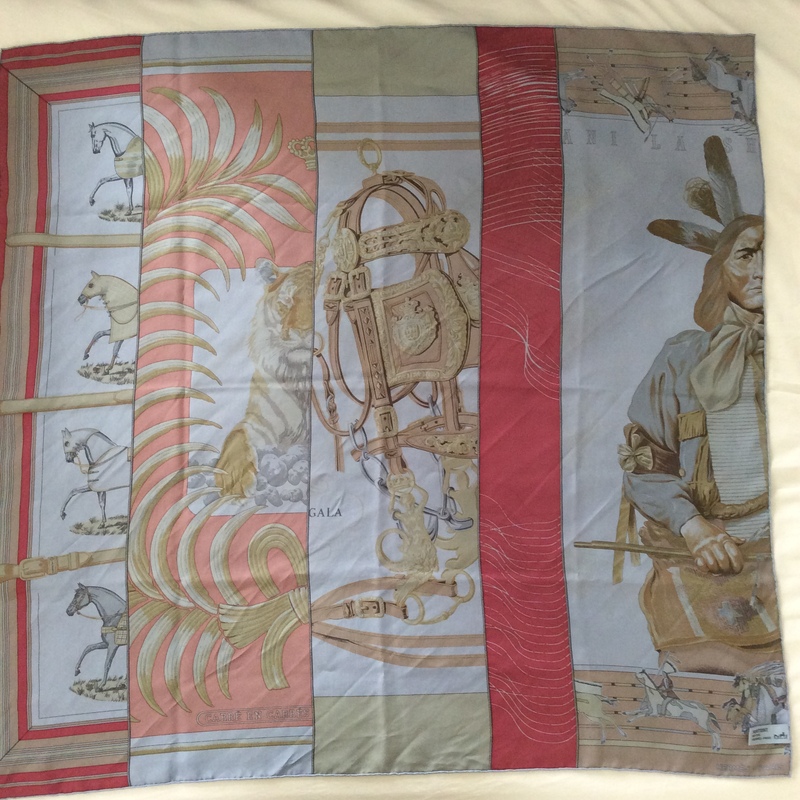 Couvertures et Tenues shows horses decked out in horsey regalia, the striped border of this one makes a particularly attractive corner, when the scarf is folded. Tigre Royal is a classic design that many of you will recognize. While I wouldn’t go for the full-on tiger myself, I love the half I get of him in this scarf. It makes him less overwhelming and I can enjoy this iconic design when I feel confident enough or hide him in the folds of the scarf. Here is the title, close-up. I think this is an ingenious scarf, as it allows you also to fold it along the strips which makes five scarves in one. When folded along the bias, the design vanishes and you get an abstract scarf that mainly impresses with its gorgeous colour. The tag, different from regular ones, is bigger and shows the colour the scarf has been overdyed with. It this case a delicate powder blue with a hint of lilac. You also see the very different other corner in this picture, it is a very different scene from the Couvertures stripy one on the other side, and therefore makes for a completely different scarf when folded to show off this side. 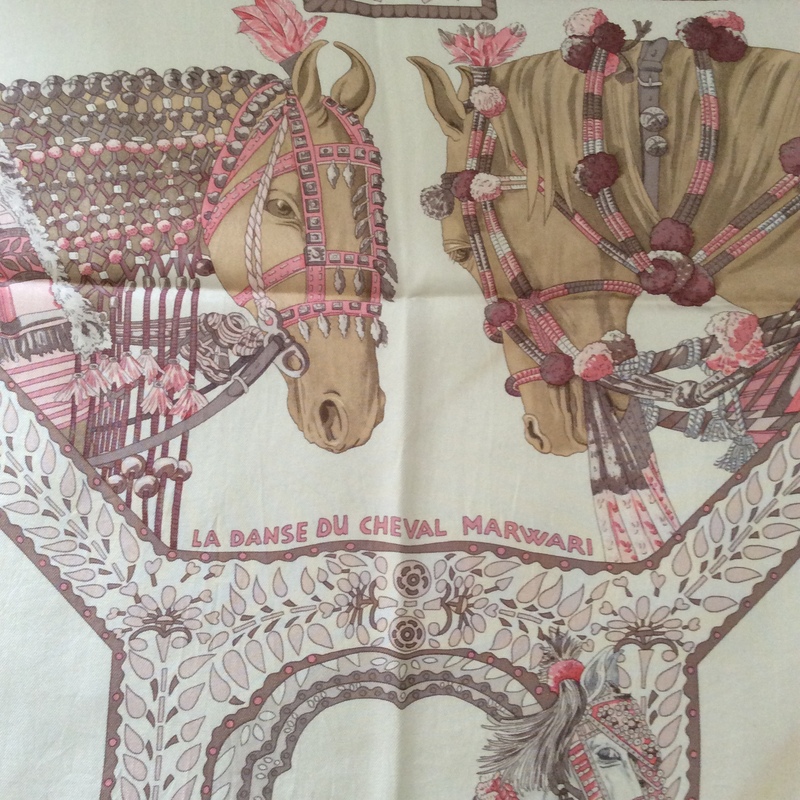 La Danse de Cheval Marwari , the second dip-dye scarf today, was designed by Annie Faivre and first released in 2008. Here you see my Cheval in dip-dye from 2014. Title and center horses (those sad and loyal eyes!). The shading in this scarf is so delicate and pretty, nothing is stark or bright (this design in bright colours is completely unwearable for me). I was happy Hermès released this particular design in a bunch of soft pastel shades last year, there also was a pink, a blue, a green and a grenadine coloured one (the latter not exactly soft and pastelly, but I mention it because it must be stunning on the right person). Having missed out on the design in 2008 when it came out the first time around, I pounced on this one right away and had to physically restrain myself not to add the pink or light blue one as well. But I picked right, I’m happy with this version. The third and last scarf is a classic in a new interpretation. Astrologie was designed by Francoise Faconnet in 1963. It has since been released several times in different iterations, my dip-dye is from the latest batch offered in 2010. 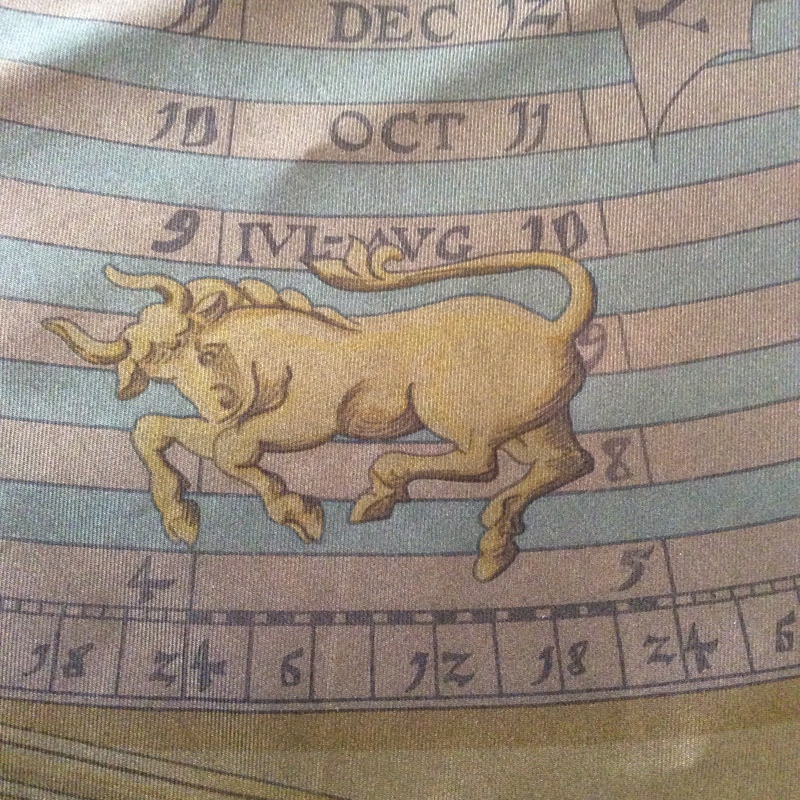 It is a design made famous by Jackie Kennedy, who loved her Astrologie (so does Oprah, btw, as I found out when researching this post). 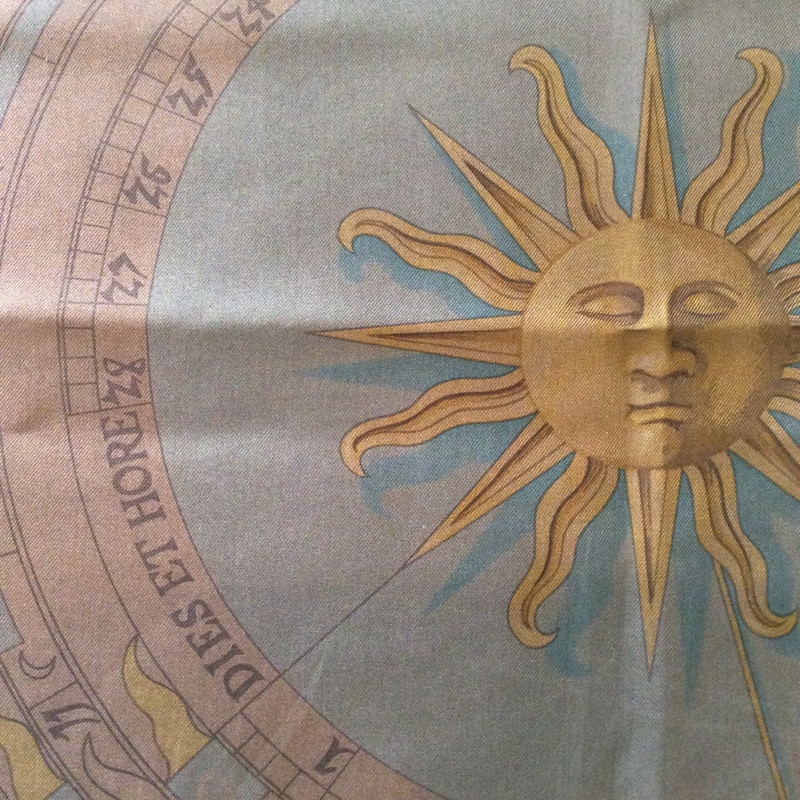 Astrologie shows a sun in the center and the twelve star signs in a circle around it. 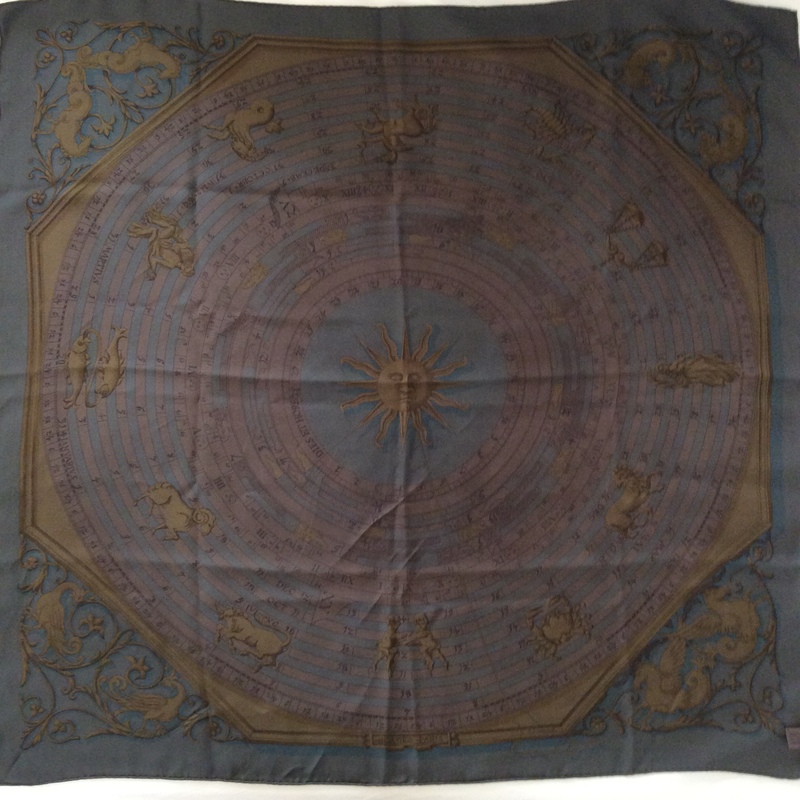 The latin inscription on the scarf, Dies et Hore, is often mistaken as the title of Astrologie, it is not, but it bears to keep this in mind should you ever look for this scarf, as many re-sellers call it by this wrong name. 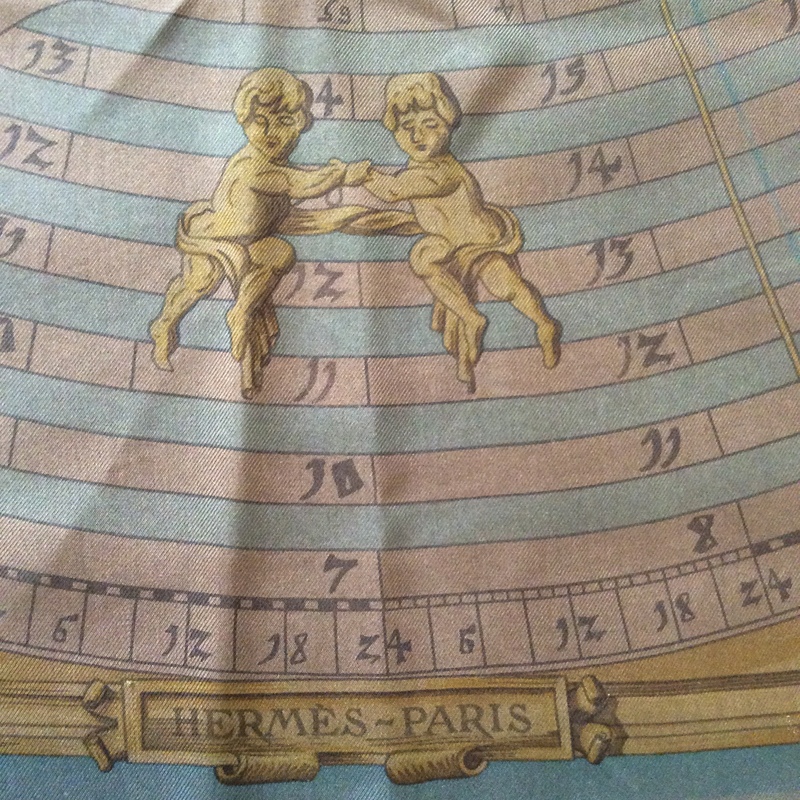 Gemini and the Hermès signature at the bottom. 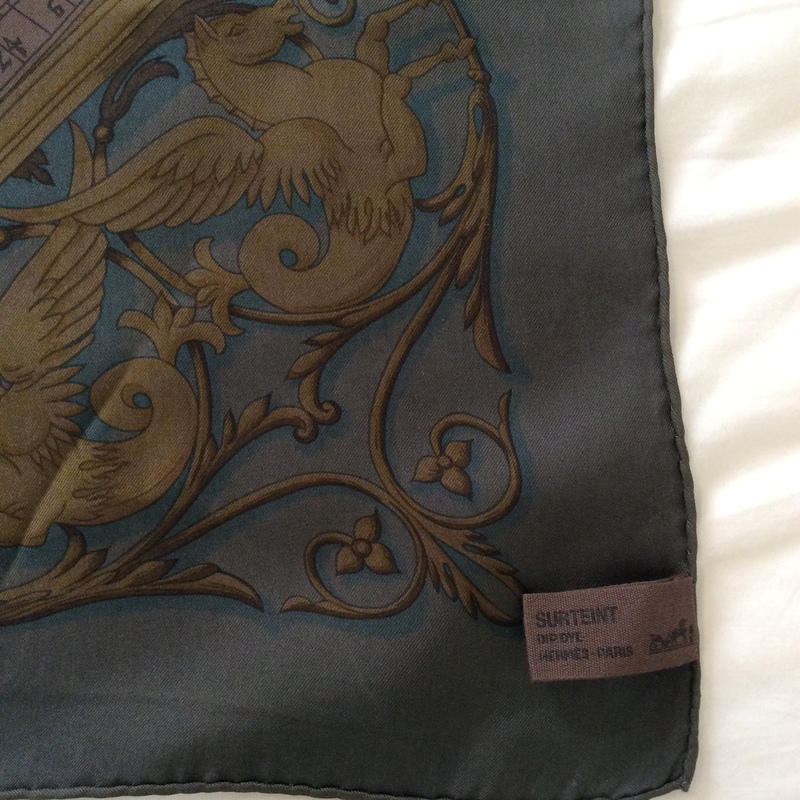 The tag showing the colour the scarf was dipped in, a muted brown. This concludes todays post, as always, thanks so much for reading, see you in the comment section! Are you familiar with the dip-dye scarves? What do you think of them? 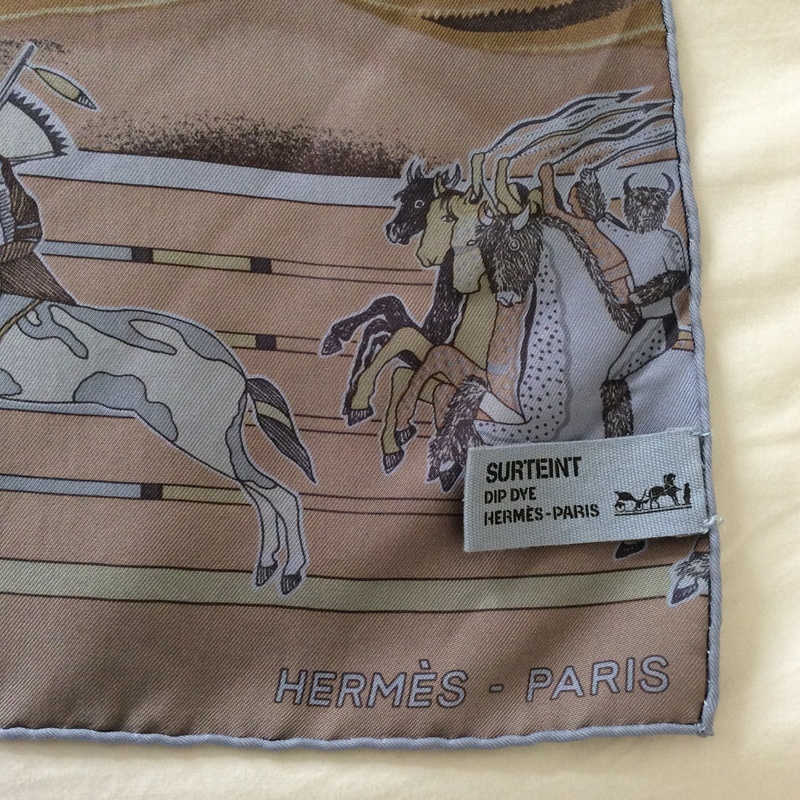 This entry was posted in Hermès, Scarf Collection, Scarves and tagged dip dye, Hermes, scarf collection, scarves, Silk Scarf, surteint. Bookmark the permalink. Dreamy is a very good word to describe them, all the colours become fuzzy and indistinct, just like the quality of things in dreams. Hippie dip-dye is indeed a world away! The soft feel and subtly of these dip-dye scarves really appeals to me. I can completely see why they are your favourite type. 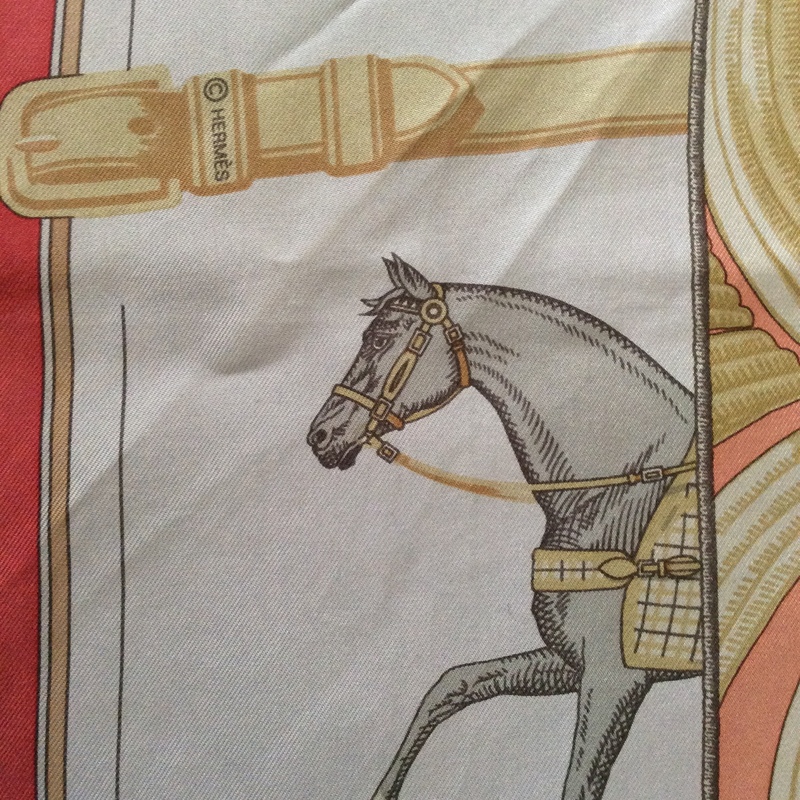 I love how Hermes regularly refer back to previous designs and their own horsey heritage. It gives a nice feeling of continuity and must be fun for collectors. It’s what I like about Hermès too, they don’t abandon their designs after a season but bring them back again and again. How nice to learn about this kind of technique, and what gorgeous scarves you show us again. I had seen the surteint on line, but never recognised its beauty. I suppose it is a little like aging, being dipped in the vat of experience can make one softer, abandon stark contrasts through becoming wiser, add depth and subtlety. I found 40 better than 30, and 50 better than 40, in most respects that is ;-), as one of our famous (long retired) football players says (in Amsterdam dialect which adds a certain grit) “Every advantage has its disadvantage” and ofcourse we can swop those words. 😉 without doubt, Erasmus and Grotius don’t compare! What a nice simile, I like that, it rings very true. As Marjo56 writes, this simile is quoted by Dutch people often, maybe you can follow the Dutch “Ieder voordeel heb ze nadeel” (and he says ‘heb’ and ‘ze’ which is sort of Amsterdam common dialect). Ah, it’s: Jeder Vorteil hat seinen Nachteil. Dutch is very easily readable for German speakers with a bit of imagination, is it the same the other way around? Yes, it is! And for most of us German was a compulsory class at high school. I love German, it such a beautiful language, but I speak it very poorly indeed. His name is Johan Cruyff! How I love these posts! I fell under the charm of a burgundy surteint Jungle Love scarf for the same reasons you mentioned (softness of the print and of the silk), but I am ashamed to say that I have not worn it yet (after more than one year), probably because it is the most beautiful carré I own and unconsciously am so afraid to ruin it. This post made me look at the Carré en Carrés with different eyes (and somehow gave me the last necessary push to buy a gold-on-brown L’arbre de soie carré on Vestiaire Collective – which I intend to wear :-). Have a lovely w-e! 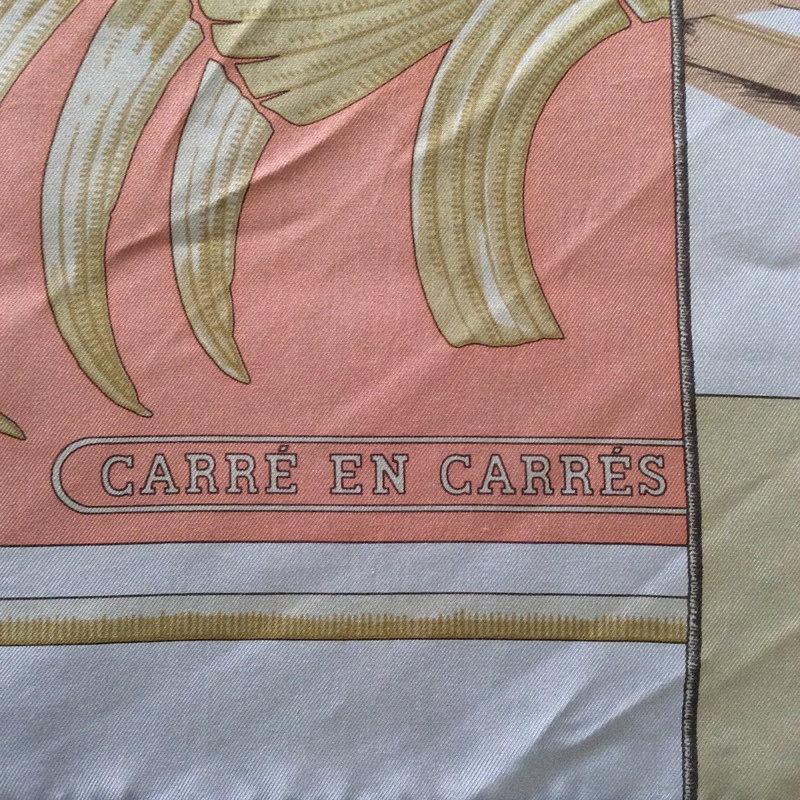 The Carré en Carrés can look garish and overly busy in bright colourways, so I understand what you mean. But in this softly and uniformly coloured piece the genius of the designs really comes out well. I didn’t know anything about this technique so it was wonderful to learn more about it. I also found it interesting that the tag reflects the dip-dye color. Of the three, the Danse Du Chevalier Marwar is my favorite for a variety of reasons. But they are all beautiful, and I love the stories associated with each of them. Thanks for a great post! and perfume articles. Thank you all. Your dip dyes are so beautiful! I own one: Brandebourgs in shades of pink and grey. I can’t wait to wear it this spring (if it will ever warm up a little!). Beautiful, Farouche! Brandebourg has such great corners. Do you have a dip dye? Oh yes, just thought of your Brides de Gala! Very interesting post, Birgit. 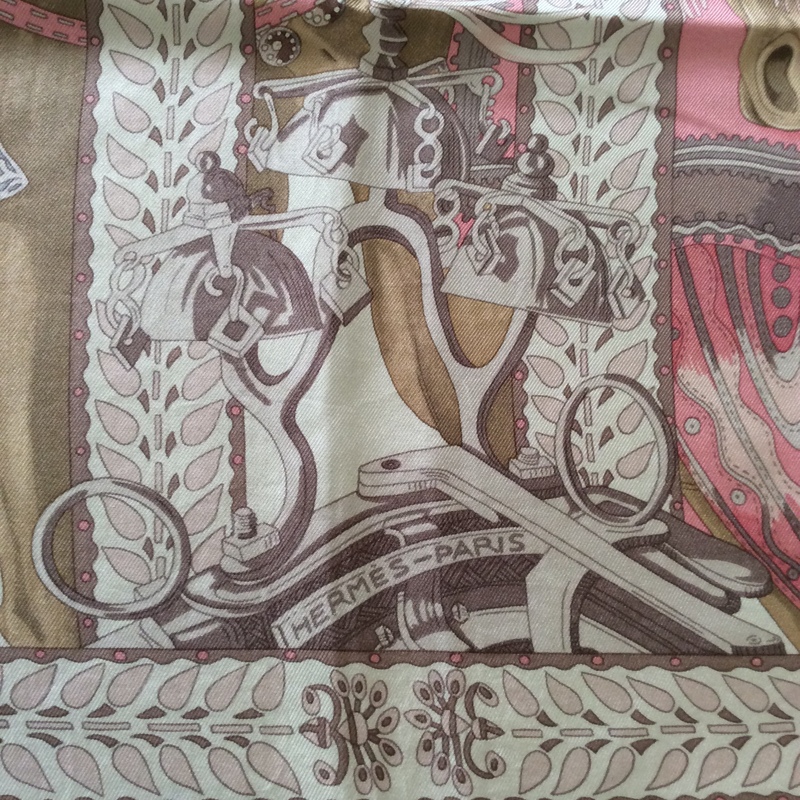 I love dip dyed T-shirts etc, but had no idea Hermes produced dip dye! And what beautiful scarves they are. 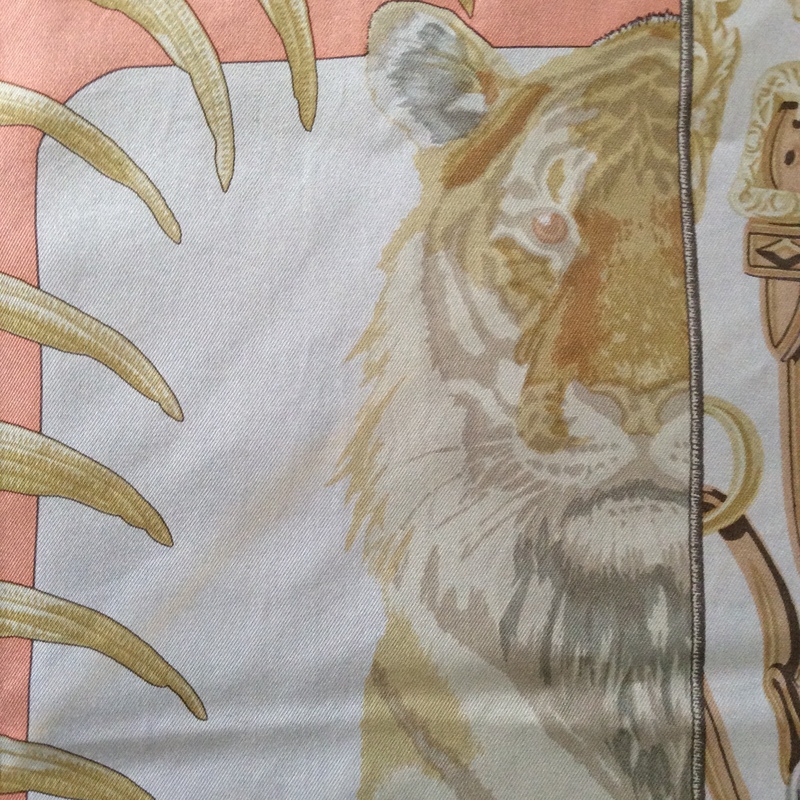 It is incredible how much skill and artistry goes into making these lovely silk squares. It is hard to pick a favourite, but the first one is so soft and ethereal-looking and I can well imagine the pleasure of wearing it regularly. What perfume do you most wear with it, I wonder?! The soft colors of the surteint scarves are delightful. Strong geometric patterns do not often appeal to me, but the three designs you’ve highlighted here are wonderful. Thank you for sharing them. Love the black and white photo of Jackie O! 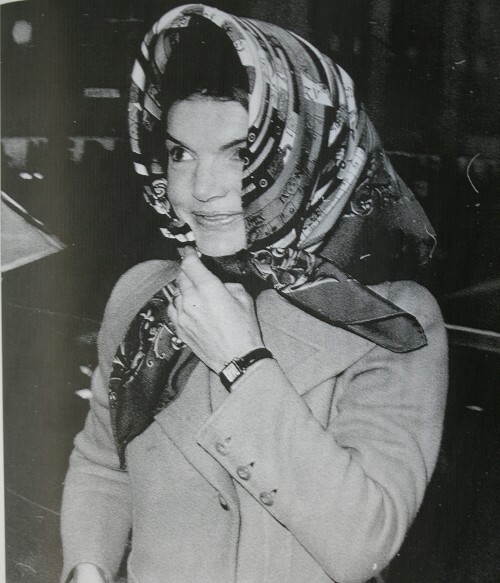 Jackie O. is such an icon. Love her. 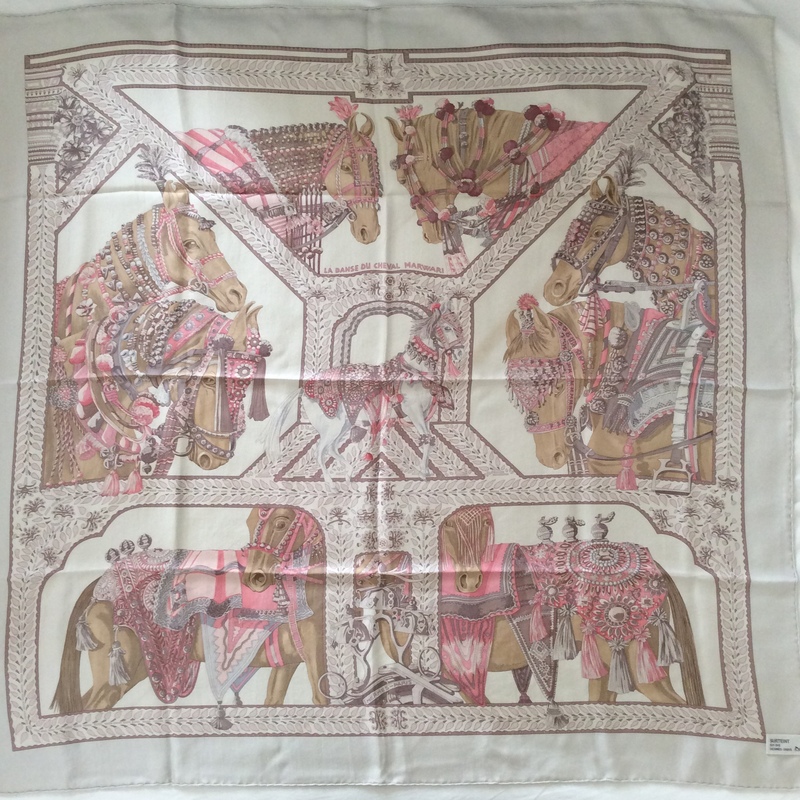 The Cheval Marwari scarf is divine and they are both so pretty and delicate looking. Love the colors. Me too. The softness of the colours and the silk itself is what makes the dip-dyes so appealing. Your collection is so beautiful. This week my favourite is the last one. The colours speak to me and I love the idea of wearing something Jackie O wore, no matter how far removed. Astrologie has a very unique colour that you don’t find very often.